The Shetland Sheepdog is the ultimate family pet, as it is extremely devoted, willing to please, and excellent with children. It is a smart and perceptive dog, which makes it simple to train the Shetland Sheepdog to live in the home. It tends to be very playful, sometimes nipping at the heels during play. It also tends to bark often. The Shetland Sheepdog is a kind companion with an ability to quickly learn and obey, but can be coy around people that it does not know. The Shetland Sheepdog is first and foremost a housedog and although it can survive outside in a temperate climate, it is best suited for living in the home. Additionally, as it is very devoted and attached to the family, separation from them is not recommended. The exercise requirements of this breed are average, with a walk, job, or play session fulfilling the daily requirements. The Shetland Sheepdog has a thick coat that will require maintenance through combing or brushing at least every other day. The major health concern for the Shetland Sheepdog is dermatomyositis, which is an immunity related disease that affects the skin and muscles. A series of lesions may appear as the first sign. There are several minor health concerns for the Shetland Sheepdog including Collie Eye Anomoly (CEA), Progressive Retinal Atrophy (PRA), trichiasis, cataracts, Canine Hip Dysplasia (CHD), hemophilia, hypothyroidism, Legg-Perthes, patellar luxation, and allergies. On occasion, the Shetland Sheepdog may experience deafness, epilepsy, Patent Ductus Arteriosus (PDA), and von Willebrand’s Disease (vWD). One must also proceed with caution when giving it ivermectin, as it may be sensitive to it. 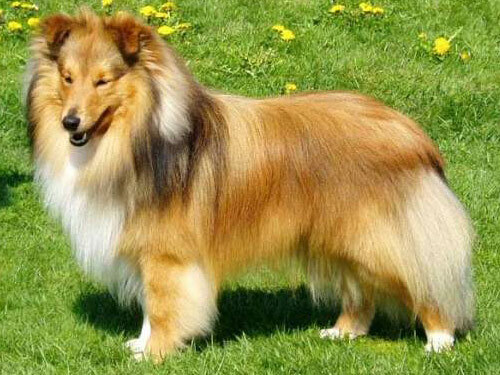 Merles Shetland Sheepdog’s should not breed with another merles as it could be harmful to its health. Without any health issues, the Shetland Sheepdog will live for an average of 12 to 14 years. The Shetland Sheepdog is a deviation of the herding dogs of Scotland. These ancestors of the Shetland Sheepdog are thought of as the originators of the Collie and the Border Collie breeds as well. These small dogs became further developed on the Shetland Islands from their earlier Collie style and it is also believed that the black and tan King Charles Spaniel and some Iceland dogs have had a role in their development. The Shetland Sheepdog quickly became useful as a herder on the farm land, as there were few fences and scarce vegetation so cultivated land needed protected from the livestock. The Shetland Sheepdog herded sheep, ponies, and chickens in these lands and although it was a farm dog, it quickly found its way into the family home during the winter months. Initially, the breed was able to breed true because of their isolated location, however once the British naval fleets began to makes stops on Shetland Island, the dogs ended up coming back with them to England. A dog of many nicknames, it was originally known as a Toonie dog, which meant farm, but later obtained the nickname of a “Sheltie”. The Shetland Sheepdog was actually originally shown under the name Shetland Collie, but those who showed Collies opposed this reference and the Shetland Sheepdog name was born. In the past, breeders in England would attempt to cross the Shetland Sheepdog with rough-coated Collies to bring out more characteristics of the Collie, however this is no longer practiced since the result was oversized Shelties. The Shetland Sheepdog is considered one of the most popular breeds that there is for families due to their loyalty and resemblance to the Collie.